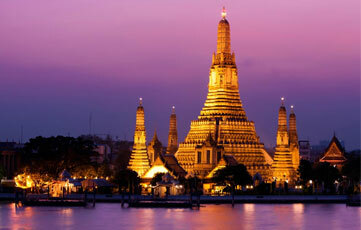 With grand attractions, Thailand affirms to be the most desired holiday destination in Asia. There are myriads of aspects which Thailand is famous for but the most intriguing one is the glorious temples in its capital city Bangkok. Thailand comprises over 31200 Buddhist temples which are locally known as the Wat. For most of the travelers, it seems to be a mission to choose among hundreds of magnificent temples to explore during their holiday in Bangkok. In order to make it simple for the travelers, we are mentioning the most significant and alluring temples which should be included in your itinerary to Bangkok. This history of Grand Palace goes hand in hand with that of the capital city – Bangkok primarily because The Grand Palace was established at the same time as this capital city 1782. The first king of the ruling Chakri dynasty gave orders to construct this enigmatic palace. The palace is an amalgamation of various alluring edifices that exhibit different themes like the royal architecture of the Rattanakosin era, traditional Thai themes and European features etc. These edifices fascinate the travelers and make them familiar with the intriguing aspects of Thailand via their charming architecture. 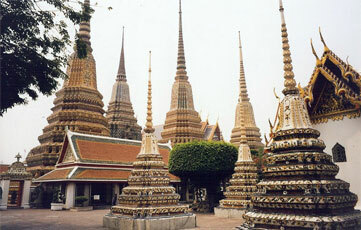 The most prominent temple among the complex is the Wat Phra Kaew. It got its prominence from the pious figure of Emerald Buddha which is not made of emerald but jadeite. This emerald Buddha dons gold garments that are changed three times with the interval of the three seasons in Thailand. Apart from Emerald Buddha, the temple boasts dazzling architecture and intricate Thai craftsmanship. Arun is the God of Dawn and the temple is devoted to the respective God as the name suggests. It is the most striking riverside landmark in Bangkok as it is gloriously poised along the banks of the Chao Phraya River. The most mesmerizing vistas of the temple can be best observed at the sunset along the river banks. During the sunset and the sunrise, the monument with its spires glitters magnificently and makes a remarkable silhouette against the skyline. Don’t miss to observe the elegant grace of the intricate architecture of the temple. The temple is a must-visit for every traveler. It is listed among the largest temple complexes in the city. The temple comprises a colossal Buddha in reclining position. It measures around 46m and is elegantly covered with a gold plated leaf. Apart from the architecture and Buddha figure, the temple is quite prominent for getting a traditional Thai massage. The travelers can visit between 08:00 and 17:00 and get a rejuvenating massage here. The temple is famous with the name of the golden mount primarily because it is poised on top of a small hill and is of golden color. The Chedi is comprises a Buddha relic which apart from the intricate architecture and craftsmanship is the main highlight of the temple. The temple has 300 steps that fringe the mount. It is advisable to avoid visiting the temple during rainy season and mid day as is would get difficult to bear the sun over the head. There are innumerable temples in the territory which fascinates travelers with their stunning features like Wat Traimit and Loha Prasat etc. If time permits do pay visit to each one of them.